A lot of people ask us what kind of dogs we use. They normally mean which breed we use, as they have seen a movie with sleddogs (usually Disney) and they want to mush exactly that kind of dogs. The breed of sleddogs that is used in Disney Movies is usually Alaskan Malamutes, and they are NOT very good for the work we do. They are rather large dogs and they will simply sink through the snow! Apart from that the breed is known for it’s dominance issues, not something we approve of. They do look very good in movies though. Asking about which breed of sleddogs we use is like asking what brand of car we use. It says more about the owner’s preference then about the kind of work we intend to do with it. I’m the proud owner of two Volvo’s, and one of them is very good with a heavy trailer behind it and in snowy conditions. The other…isn’t that good in the same conditions! The important thing is which type of car one uses, for example a terrain vehicle. Our dogs are touring dogs, trained to run distances of up to 40 km a day and prepared to sleep outside at temperatures as cold as -30 (and we are not afraid to say we use dogblankets, and straw for the dogs to lay on if we have the opportunity!). So which breed are our dogs? They are Alaskan Huskies, which isn’t a breed at all, but a crossbreed. If we would talk about cars, we would talk about custom-made cars. 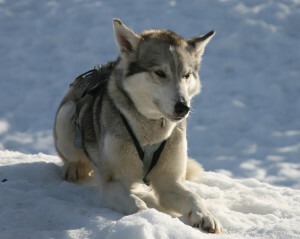 Breeders take the best qualities of breeds like Greenland, Siberian and many others to get the perfect dog for the job. In our case that means strong healthy sleddogs with a good fur, who love to work and who are social with people. Some of them might even look like a “Disney husky”! And each dog has its own character and personality. That’s how we know them all by name!